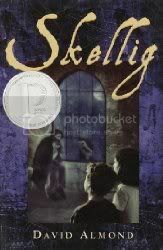 Skellig is one of those books that each reader will take something distinctly different from it. I'm not even sure I know what I took away from it. Was it a book about hope and faith? The mysteries of the great beyond? I'm not really sure, but given that I'm still thinking about it a couple of weeks after I read the book is a good sign that it did make me think. Michael's life has been turned upside down. He's moved to a what was promising to be a shiny, new home but instead has found himself in a rundown house that is in need of severe renovations. He has moved away from his usual school, but has elected to take the bus across town to be able to still attend so he can be with his friends. Add to all this his little sister being born prematurely, and Michael finds that his mother and father may be a little too preoccupied to be able to pay much attention to him and he's forced to "understand" a lot when things aren't going as he thought they were going to. One day while exploring the ramshackle garage behind the house, Michael discovers what may or may not be a person under the spiderwebs and dead flies. The only person that Michael feels confident in disclosing his secret to is his new friend Mina. Mina seems to understand what the man in the garage is and what he means, and together Michael and Mina help to bring him out into the open again. I'm going to stop there. What makes the book so powerful is the discovery and journey you take with Michael and Mina as their lives begin to change as a result of the being in the garage. This is a reasonably fast read, so it won't take anyone long to finish it, but the story lingers far after you've finished reading it. David Almond gives you just enough of the pieces of the puzzle so that you can almost understand what's happening, but leaves everything just ambiguous enough so that you can reach your own conclusion without being weighed down by a finite answer. I don't usually like ambiguous storytelling; I generally like my story spelled out in black and white for me, but in this case, I'm happy to have my own thoughts on what the book means to me. Reviews are coming! I promise! !